Peppermint essential oil is derived from the leaves of Mentha piperita, which belongs to the Lamiaceae family. The genus Mentha comprises of over 20 individual species with a diversity of varieties and chemotypes, most of which have aromatic foliage that contain essential oil. However, only the essential oil extracted from Mentha piperita and Mentha arvensis (Cornmint), has the sharp, crisp and familiar aroma we usually associate with the term ‘peppermint’. Mentha piperita is a perennial herbaceous plant reaching a height between 20 or 30 inches (50-76cm) and has smooth, quadrangular upright stems that branch towards the top. The plant propagates by underground runners called stolons, and its spreading, invasive habit forms an abundant carpet of oval, serrated, deep-green coloured leaves. The flowers are spike shaped and usually purple in colour, placed in whorls around the stems. There are several varieties of Mentha piperita, but the two forms that are most extensively cultivated are commonly known as ‘white’ and ‘black’ peppermint. White peppermint (M. piperita var. officinalis L. forma palescens) is usually a smaller plant and has green stems and leaves with white flowers. Common black peppermint (M. piperita var. vulgaris) has dark green leaves with reddish veins, purplish stems and purple flowers. White peppermint was at one time the preference of herbalists and purchased in dried bundles. Black peppermint is mainly used for the production of essential oil since it is a hardier plant and produces a higher yield of oil. The peppermint essential oil produced in England has traditionally been considered to be the very finest available and is derived from a variety known as Mitcham (Mentha piperta forma rubescens), having been named after the area in Surrey where it was originally produced. 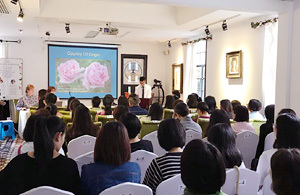 Accounts of the use of peppermint in medicine and as a flavouring agent have been recorded in China, Japan, Egypt, India, Greece, Rome and many other European countries. The Greeks and Romans would adorn themselves with mint crowns, and at feasts it was used to decorate tables and flavour sauces and wines. The great Roman naturalist Pliny the Elder (23–79 A.D.) advised scholars to wear a crown of mint as an aid to concentration. Clearly, he was an aromatherapy pioneer! In folk medicine, peppermint has been used over thousands of years to treat numerous conditions both internally and externally. Rubbing a few leaves on the forehead was a common cure for headaches, and as an infusion it was used to treat arthritis, rheumatism and muscle spasms. Its cleansing and antibacterial action was highly prized for treating respiratory conditions such as asthma, bronchitis and sinusitis. The action of peppermint in teas was, and still is, unrivalled for curing indigestion, heartburn, flatulence, colic, nausea and vomiting, as well as the symptomatic treatment of coughs, colds and fevers. Harvesting peppermint takes place when the essential oil content of the leaves is at its highest level, which is normally as the herb reaches full bloom. As this time approaches, expert farmers will conduct daily tests to identify when key components are at optimum levels, thereby ensuring that harvesting takes place at precisely the right time. After harvesting, the leaves are partially dried prior to extraction since excess moisture in the leaves can cause difficulties with the process of extraction, thereby leading to a reduction in yield. The essential oil is extracted by steam distillation of the leaves, producing a pale straw-coloured oil with a wonderfully refreshing, diffusive and minty fragrance. Peppermint essential oil is extremely versatile and can be used for a broad range of applications. It’s clearing, antiseptic and anti-infectious action is particularly suited to the relief of headaches, migraine, hay fever, sinus and catarrhal congestion, as well as general coughs and colds. 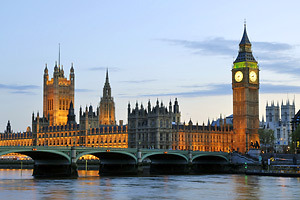 The stimulating aroma of peppermint essential oil when inhaled relieves the symptoms of travel sickness, jet lag and general fatigue, whilst in massage it is particularly helpful with digestive disorders such as irritable bowel syndrome, indigestion, colic, stomach pains, nausea, vomiting and diarrhoea. It also works effectively with emotional states such as mental exhaustion, impatience, indecision, irritability, poor memory, shock, and improves mental clarity/lack of concentration. Peppermint is a highly adaptable and effective essential oil that is absolutely indispensable in aromatherapy. However, it is very powerful and should be treated with respect at all times, and only very small quantities of this oil are required to receive its many therapeutic benefits. When inhaling undiluted peppermint essential oil from a tissue etc, be sure not to inadvertently get any in your eyes or nose (or other sensitive areas) because it is a mucous membrane irritant. Peppermint oil is best avoided on children less than 3 years old, and keep the undiluted oil away from the nostrils of babies to avoid the possibility of apnoea or other breathing difficulties. Peppermint essential oil blends with basil, cedarwoods atlas and virginian, cypress, eucalyptus, geranium, juniper berry, lavender, sweet marjoram, pine, rosemary and all citrus oils. 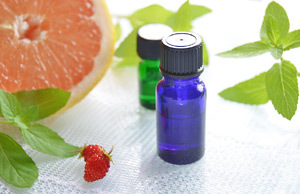 This essential oil is considered a top note in aromatherapy. 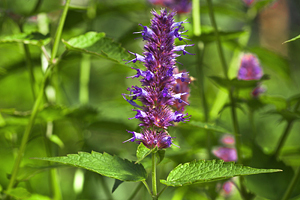 Essential oil of cornmint (Mentha arvensis) is often used as a starting material for the extraction of natural menthol, since this oil contains very high levels of this valuable constituent. After isolation, the extracted menthol is sold on to the flavouring, pharmaceutical, and perfumery industries. 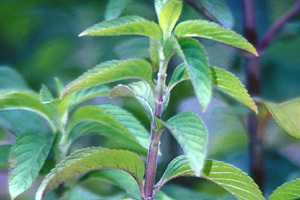 The remaining depleted essential oil still contains around 45% menthol after the process of dementholizing, and therefore smells very minty. However, it is not uncommon for this now ‘incomplete’ essential oil to be sold on by unscrupulous bulk traders to inexperienced manufacturers and oil suppliers under the guise of ‘peppermint oil’. Above: Leaves of M. piperita officinalis forma rubescens (Black or Mitcham type), which originated in the United Kingdom and is the parent species of all the Mitcham peppermint grown around the world. In the early 1900’s, ‘black Mitcham oil’ as it was then known, commanded a price up to 8 times higher than peppermint produced anywhere else in the world, including France.